The Studiophile CX8 near-field studio monitor extends M-Audio’s 20-year legacy of engineering advanced music creation solutions. Designed by our dedicated team of monitor engineers, the CX line combines proprietary driver designs, custom waveguides, seamless crossover integration and advanced Acoustic Space controls. The result is a best-in-class monitor series with excellent off-axis response, minimal distortion, an expansive soundstage and the flexibility to adapt to any production space. The Studiophile CX8 monitor brings exceptionally accurate monitoring to any acoustic environment - establishing a new benchmark in its category. 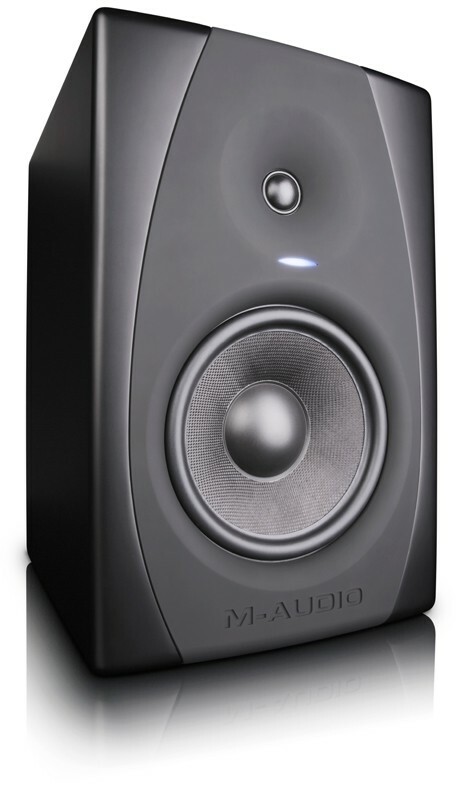 Over the last 20 years, M-Audio has developed award-winning creative solutions and become an established leader in multiple product categories, including studio monitor technology. The company’s Los Angeles-based engineering team created the innovative reference solutions that propelled M-Audio to become the best-selling monitor manufacturer in the United States - then applied its extensive expertise to develop the CX series. The result is a line of world-class reference monitors that reset performance expectations for their class. Most near-field monitors require close and specific placement to yield acceptable stereo imaging. Years of research and work with waveguide design culminate in the amazing continuity, breadth and depth of the Studiophile CX8 soundstage - even in challenging placement and listening conditions. Our custom OptImage IV waveguide design improves overall detail and clarity. It also controls the dispersion pattern of the mids and highs, offering a much wider soundstage than traditional waveguides. As a result, the CX8 monitor delivers an accurate, detailed representation of your mix with a remarkably broad sweet spot. Your listening environment and speaker placement greatly impact the performance of your monitors. To ensure effective monitoring in your unique production space, the Studiophile CX8 monitor offers Acoustic Space controls for tailoring each speaker to your room. Acoustic Space settings include -4dB, -2dB and Flat - and the monitor also features LF Cutoff, MF Boost and HF Trim switches for additional customization. These settings help to optimize frequency response within even the most difficult acoustic environments. The finely tuned integration of acoustic and electronic design elements in the CX8 monitor delivers cohesive sound - from solid bass, to well-defined mids, to smooth, transparent highs. Featuring a high-grade damping surround, the premium, Kevlar, low-frequency driver maximizes excursion to provide a clear, articulate low end with a bass impact you’d expect from a larger enclosure. The silk-dome, high-frequency driver with oversized 1.25-inch voice coil delivers an exceptional high-frequency response up to 30kHz. The CX8 components are designed to work together so that the entire system has superior headroom, resulting in lower high-frequency distortion and reduced listener fatigue compared to other monitors in its class. The bi-amplified design dedicates 80 watts for the lows and 40 watts for the highs. The low-frequency driver’s venting and large voice coil provides both thermal and acoustic headroom. The high-frequency driver features an optimized, sealed rear chamber for more audible headroom (as well as lower frequency extension for greater mid-range clarity) than similarly priced products. These factors also contribute to a more uniform response at a variety of listening levels - allowing you to work longer without fatiguing your speakers or your ears. Support for M-Audio products can be found at www.m-audio.com.